View More In Moscow Mule Mugs - Page 2. Moscow Mules are all the rage right now, but are you looking for something different and exciting? Look no further! 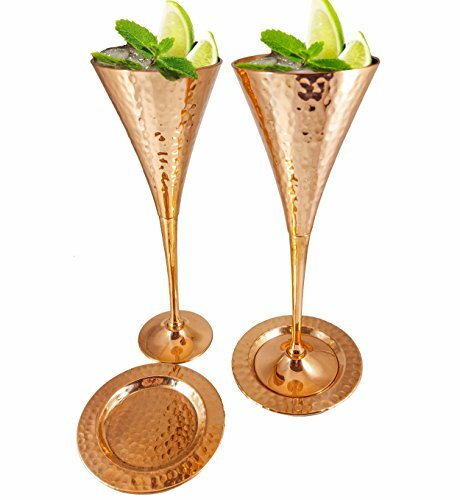 Change the face of entertaining with Kamojo Moscow Mule Copper Champagne Flutes! These Hammered Copper Champagne Flutes are the best choice to serve not only a new kind of Moscow mule, champagne or other iced cocktails. But, they also make for stunning appetizers for any special occasion. In addition, these copper flutes make for amazing toasts at weddings, anniversaries or a romantic dinner for two! They are especially great for a new kind of experience created by our daughter for her wedding. Introducing the Champagne Moscow Mule: 1/2 oz Vodka, 1 oz ginger liquor (Domain de Canton), 1/2 to 3/4 oz lime juice (half a lime), 5 oz. Champagne or Proscecco plus mint to garnish. Fresh and delish! Kamojo Moscow Mule Champagne flutes are hand-crafted with copper, not lined with nickel, tin or stainless steel and have a completely different look that sets them apart from all other mugs and flutes. Our champagne flutes are 9 inches high, hold 7 oz. with a flawless transition from stem to bowl and feel great in the hand. Every flute is covered with a protective coating to keep the real shine of the copper. Hand wash & dry. Not dishwasher safe. Our guarantee is completely linked to your satisfaction. So we offer a complete ONE YEAR GUARANTEE in case of any material or workmanship problem. Very Important! Because of the extremely high demand for our Moscow Mule Copper Flutes, we may run out of inventory fast.So, order your Kamojo Champagne flutes 2 piece gift set today and avoid any disappointments. EXCLUSIVE - Kamojo Flutes are an impressive 9 inches high and hold 7 oz. of your favorites beverage or appetizer. Exclusive and unique design you won't find anywhere else. CHAMPAGNE MOSCOW MULE RECIPE - 1/2 oz Vodka, 1 oz ginger liquor, 1/2 oz lime juice (half a lime), 5 oz. Champagne or Proscecco plus mint to garnish. Fresh and delish! GUARANTEED ONE YEAR - Love our Moscow Mule Flute Set of 4 or get your money back. No questions asked. Impress your friends with the newest design in copper! If you have any questions about this product by Kamojo Mule, contact us by completing and submitting the form below. If you are looking for a specif part number, please include it with your message. Set of 40 Pure Copper Moscow Mule Mugs by Mule Science with BONUS: Highest Quality Cocktail Copper 40 Straws, 2 Shot glasses and 40 coasters!